Home Article Television Personality Laura Ingraham; Single Mother of Three Children, Is she Dating someone? Television Personality Laura Ingraham; Single Mother of Three Children, Is she Dating someone? American television and radio personality Laura Ingraham who has dedicated nearly four decades of her career in journalism has successfully maintained her professional and personal life. The conservative political commentator and a best-selling author is also a proud mother of three. Who is the father of her children? Is she dating anyone? We have all the details about Ingraham's personal life. The 55-year-old American radio and television personality Laura Ingraham is a single mom. She is a proud mother of three children: Maria Caroline, Michael Dmitri, and Nikolai Peter. Ingraham is not the biological mother of the kids, but "biology is the least of what makes someone a mother" right!!!! She is a proud mom and loves her children like every other mother in the world!!!! She adopted her first child, daughter, Maria Caroline in May 2008 from Guatemala. At the time, Caroline was three-year-old. Then a year later, Ingraham and Caroline welcomed Michael Dmitri in July 2009. Dmitri was adopted from Moscow. Two years later, the conservative radio host again adopted her third child, son Nikolai Peter from Russia in June 2011. Currently, she is not dating anyone and also she was never married before. Ingraham has been engaged twice, but neither of her engagement turned to marriage. She was in a romantic relationship with several high-profile personalities. She was once in a relationship with liberal broadcaster Keith Olbermann. She also dated Robert Torricelli who is the former New Jersey Democratic Senator. Olbermann is still an unmarried man. He was once in a relationship with journalist girlfriend Katy Tur. She was also engaged to Dinesh D’Souza. D’Souza was an Indian author. The engagement, however, was canceled later. The couple didn't disclose the reason for the split. You May Like: Radio host Mike Francesa and his wife Rose Francesa married since 2000. Know their married life. In addition to the list, Ingraham also dated Chicago businessman James V. Reyes. The couple got engaged in April 2005. But before their engagement led to marriage, the couple called a quit. In May 2005, she revealed that her engagement to Reyes ended because she was a diagnosis of breast cancer. Ingraham was born on June 19, 1963, in Glastonbury, Connecticut, U.S.
She is Anne Caroline (née Kozak) and James Frederick Ingraham III's daughter. Her birth sign is Gemini. Ingraham attended Glastonbury High School. She also studied at Dartmouth College from where she received a B.A. degree and the University of Virginia School of Law from where she received a Juris Doctor degree. During her early career, she served as a law clerk. Then she served as a speechwriter during Ronald Reagan’s tenure. 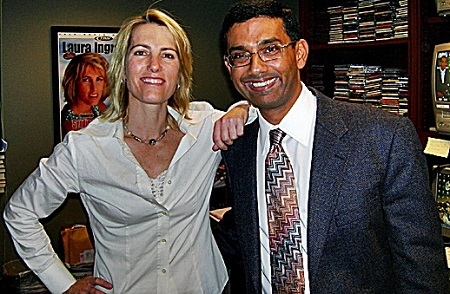 She started her radio career from the show The Laura Ingraham Show in April 2001. Her debut book as an author was The Hillary Trap: Looking for Power in All the Wrong Places which was published in June 2000. Ingraham's estimated net worth is $70 million, and her salary is $15 million per year.